Building upon my experience as an undergraduate, I create my first Computer-Based-Education [CBE] system in the late 1960s—it was named LINGO, and it was the start of a series of CBE languages, systems and theories about building structures for computer-human interaction in learning. 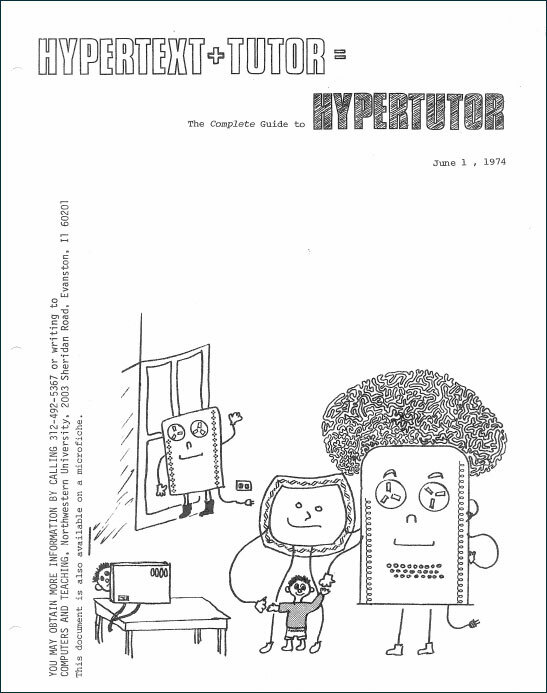 In the early 1970s I developed HyperTutor, which was later renamed MultiTutor. The ideas behind these systems, and the things I learned from operating the systems, later informed my planning and morphed into the Courseware Design System [CDS] of 1976-79. Of these, MultiTutor is best known, but CDS was by far the most important conceptual leap.— Jim Schuyler. HyperTutor was motivated by a dream. That somehow human knowledge could be cataloged using an organizing spatial metaphor and made available online. (This was the time when spatial-database-management or 'desktop' metaphors were first popular.) To facilitate exploration and learning, the idea was to organize lessons into such a structure. To facilitate the creation of lessons, the idea was to provide the Tutor-IV language, used on the Plato-IV computer-based-education system, so professors and students could create interactive, online teaching and learning experiences. Essentially these were learning objects, without explicitly being so named. HyperTutor could run programs written in the Tutor-IV language. I soon changed the name from HyperTutor to MultiTutor — the “Multi” enbodying one of its design goals, namely that the system would make the benefits of the Tutor-IV language, and its many education programs, available on computers that were not dedicated to CBE — in other words, general-purpose supercomputers driving a broad range of remote terminal types. The Courseware Design System [CDS] was written in order to embody a Universal Acceptor model. In this model, a single computer would be able to accept programs written in Tutor-IV, Coursewriter III (IBM), PILOT (Marty Kamp @UCSF), BASIC and other languages, and use them on simple terminals connected to time-sharing computers. The Courseware Design Translator [CDT] program accomplished this goal by translating frames of Tutor-IV and other languages into an internal canonical representation of computer-human interaction (called CDL—the Courseware Design Language), which could then be used by the computer to interact with a learner. CDT could also translate the canonical form of the program into other languages, providing the ability to convert Tutor-IV for instance, into Coursewriter III or BASIC for execution on PDP-11 computers around the world. Translation rules were written by system programmers using a third program, CDX. To integrate a new programming language into the system “simply” required building a ruleset in CDX. The author could then write directly in (subsets of) any of the languages for which there were translation rulesets. CDS also contained, for the first time anywhere, a multi-tier model in which the same programming language (the CDL canonical language itself) could be used to write online interactions with courseware authors, and turn the results of those interactions into CDS programs to be run by students. This model had been abstracted to include the fundamental layer and two layers of meta-interaction by 1979. The CDS work was carried out at the University of the Pacific, Pacific Medical Center (San Francisco) from 1976 to 1978, and sponsored by the National Library of Medicine [NLM] and other US governmental agencies, as well as at WICAT, Inc. during 1978 and 1979, where the work was sponsored primarily by a grant from Digital Equipment Corporation.